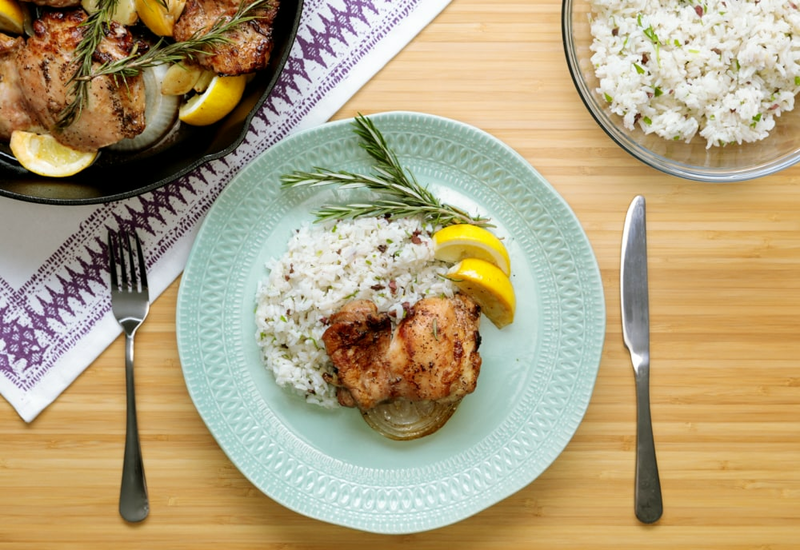 This recipe delivers both a delicious chicken dish and a rice side, giving you two meal components in one dish! Serve this for date night, a dinner party, or as a fancy weeknight dinner. Make a side of roasted asparagus or broccoli and you have a complete meal with a pop of green. Open a bottle of Malbec or Pinot Noir and you are ready! This makes a fantastic dinner party dish; simply double the ingredients to make a great family-style centerpiece that everyone can dig into! Try honey or agave nectar instead of the maple syrup in the marinade. Quinoa works well instead of the rice, if you are looking for a whole grain and a little more texture. Orzo is also a good option in place of the rice. Or mix rice and orzo! Per Serving: 322 calories; 9g fat; 50.2g carbohydrates; 12g protein; 42mg cholesterol; 381mg sodium. I was worried that the balsamic glaze that they made would stick in my cast iron pan and create a big mess, so I did part of it in my non-stick pan and then finished it on a baking sheet. This was a huge mistake, because a week later I made it again in cast iron and it tasted SO much better. The real difference was in the onions, which caramelize in the pan and turn out great. The olive rice was so good, the parsley made it so flavorful. The chicken was also delicious! I'm thinking about adding this recipe to my holiday menu. I've never had olive rice before, and I was a little hesitant at first. However, it was really good! Parsley is my new favorite ingredient to cook with, and I was excited to try it in the rice. The meat was also very flavorful, a sweet and zesty combination. I felt like a real chef after making this! This was so good! I did lemon rice instead of olive rice, and it worked perfectly with the balsamic chicken. I just added lemon juice and extra zest. I also subbed maple syrup with honey. Such a delicious meal! Loved the marinade, but skipped the sweetener. The olive rice was my favorite, I plan to make this again soon. I used Jasmine rice and it was perfect, so fragrant!